Stolen from Erics - Beyond the Dyno blog Eric got it from the Option Magazine that Cosworth , and he are in. Eric doesn't seem to like the numbers that the Dynapack spits out at you. I have found that Dynojet, Dynapack read very similarly. He has spent a lot more time on the dyno than me , but I know what I have seen. 500 whp with an exhaust change is no joke. I did not think the ECU would allow the car to run higher boost, with changes like this. It seems like the all knowing , all controlling ECU is not as big and bad as Nissan said it was. I really don't like the look of this exhaust still. Who really needs 4 exhaust tips ? Works great for the Corvette guys , I want to see a true twin, or one big single exhaust. Add some mid-pipes , add some boost , and we will see 550 whp. After a comment on here I noticed that the TC is set to 1.05 and the gear ratio is not setup correctly . The gear ratio will not have too much effect, the TC will. Maybe the ECU "knows" that the car is on a dyno, and allows the engine to produce power. It probably uses its GPS sensors to determine known dyno locations on the planet. 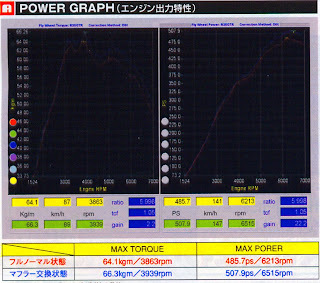 As soon as the car leaves the dyno area, it will return back to normal horsepower. The differential ratio, doesn't pay that much into the overall figure. If anything they ran it in a lower gear, and the hp figure will show a litle later. What they did show is 485 then 505. The TC factor though, that is correction. 507/1.05 = 482ps.